One of the main reasons Scottish unionist MPs are so desperate to keep the UK together is self-preservation. Post-independence, they’ll have no say in Westminster matters and with no affiliation to Holyrood, unlike MSPs, they’ll have no say there either. They’re going to be out of work. 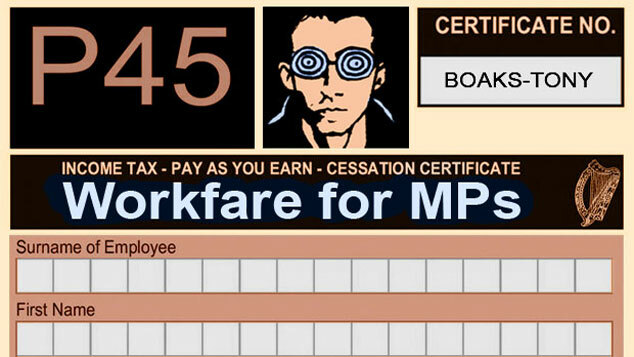 As there are 59 Scottish seats in the Westminster parliament and 41 of them are held by Labour, it’s not hard to see who’ll be dealt the majority of the p45s. This could be a problem for the Scottish Government, as seeing Jim Murphy wandering the streets around Holyrood with his face tripping him would dampen anyone’s spirits. Unfortunately, finding a solution might not be so straightforward. Most unionist MPs are unfamiliar with the concept of real work and if you handed them a shovel they’d probably ask what it was. Obviously, being unemployable is no hindrance if you intend to join Lord Foulkes in the upper chamber. But what if you want to be useful instead? Let’s ignore the possibility that some, incensed at Scotland having chosen independence, might refuse to have anything to do with their native country. Instead, we’ll assume that self-preservation and love of limelight win out and that the redundants agree to make the most of it, albeit through gritted teeth and near-continuous whining. First off, if they intend to remain in Scotland, they’ll find they belong to parties which don’t yet exist. Actual Scottish parties will have to be formed which don’t depend on being told what to do by Westminster. This could be challenging for many. Some might hope to be parachuted into a safe seat south of the border. But as, in their own words, they’d be considered foreigners in the remainder of the UK, this could be problematic. It’s really only an option for Scotland’s last surviving Conservative MP, David Mundell, because one Tory more or less in England won’t be noticed. For the rest, it means fighting through a selection process, competing with each other and standing in elections which they have no guarantee of winning – having told the electorate that they were rubbish for so long, the electorate have taken to returning the compliment. In other words, even for the successful ones, getting back to work is going to take time. They could be unemployed for years in the interim period and still have no actual skills at the end of it. That’s why I’m advocating a new Workfare scheme for former Scottish MPs. I know that this type of scheme has had terrible press and would not normally be considered by the Scottish Government. But as the vast majority of the MPs in question prefer to play by Westminster rules, it seems only fair to introduce, solely for their benefit, a system which they allowed to pass into law for the rest of us. Following a Yes vote, there will be 18 months of deliberation whilst unionist MPs continue to draw a salary and ask each other whatever happened to the West Lothian question. On independence day, some sort of severance package may be agreed, although the Scottish Government could avoid any part in this by retroactively introducing legislation, again in keeping with Westminster rules, to avoid having to make any payouts. The former MPs will then be expected to stack shelves, mop floors and complete other menial tasks without payment for large profit-making businesses in order to gain references and experiences of the “working world”. One MP who will not have to take part in the new scheme is the member for Glasgow South West, Ian Davidson. Davidson has been in several high-profile videos recently, and with his light and breezy charm, producers have marked him out as a natural for television. A new sitcom, “I’m not angry, I’m effing furious” is due to air in September 2014 when his light and breezy charm should be at a peak. In conclusion, unemployment is not funny unless it happens to an MP.